Bellefontaine Cemetery is a nonprofit, non-denominational cemetery and arboretum located in St. Louis, Missouri. Founded in 1849 as a rural cemetery, Bellefontaine is home to a number of architecturally significant monuments and mausoleums such as the Louis Sullivan-designed Wainwright Tomb, which is listed on the National Register of Historic Places. The cemetery contains 314 acres (1.27 km2) of land and over 87,000 graves, including those of William Clark, Adolphus Busch, Thomas Hart Benton, and William S. Burroughs. Many Union and Confederate soldiers from the American Civil War are buried at Bellefontaine, as well as numerous local and state politicians. On March 7, 1849, banker William McPherson and lawyer John Fletcher Darby assembled a group of some of St. Louis's most prominent citizens to found the Rural Cemetery Association of St. Louis. This association sought to respond to the needs of a rapidly growing St. Louis by establishing a new cemetery several miles outside city limits. St. Louis was experiencing exponential population growth during this time and city leaders thought that the existing graveyards, which were mostly concentrated along Jefferson Avenue near the city center, were an impediment to urban development. Many were also convinced that city cemeteries represented a public health hazard (see miasma theory). These problems were compounded during the summer of 1849, when a massive cholera epidemic swept through St. Louis and claimed the lives of more than 4,000 people. With existing cemeteries running out of space to expand, and with many residents fearing that fumes from nearby cemeteries could cause them to fall ill en masse once again, this epidemic further underscored the need for a new rural cemetery for St. Louis. In 1849, the Rural Cemetery Association purchased the former Hempstead family farm located five miles northwest of the city, with the intent to turn it into a large rural cemetery modeled after Père Lachaise Cemetery in Paris and Mount Auburn Cemetery in Massachusetts. The 138-acre Hempstead farm was situated along the road to Fort Bellefontaine, and as a result the Association decided to name its new cemetery after the fort. Within a few months, the Association had hired landscape architect Almerin Hotchkiss, who helped design Green-Wood Cemetery in Brooklyn, New York, to begin drafting and implementing a master plan for Bellefontaine. Hotchkiss went on to serve as superintendent of the cemetery for the next 46 years; he designed most of Bellefontaine's roadways and landscaping, and oversaw maintenance of the grounds. During this time, the cemetery steadily acquired more land so as to provide room for future growth. By 1865, it had reached its present-day size of 314 acres. The first burial at Bellefontaine Cemetery took place on April 27, 1850, and the official dedication followed several weeks later. Bodies from older graveyards within the city of St. Louis were moved to Bellefontaine, including some from the cemetery by the Old Cathedral near the Mississippi River. 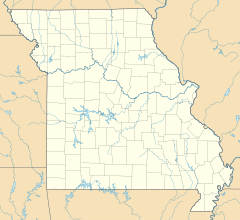 Bellefontaine was also the resting place for several victims of the 1855 Gasconade Bridge train disaster, the worst railroad disaster in Missouri history. Also interred at Bellefontaine are members of several notable brewing families, including the Anheusers, Buschs, Lemps, and Griesediecks. In 1909, the renowned St. Louis architectural firm Eames and Young was commissioned to design a new chapel for the cemetery. The Hotchkiss Chapel, named for the cemetery's first architect, was completely renovated in 2009, and an indoor columbarium was added on to the back. The chapel is currently used for weddings and memorial services. Two new outdoor columbaria have also opened for inurnments; and a "green burial" natural interment section is pending. Cemetery patrons with traditional tastes for family lot group burials and private mausoleums can still obtain these memorialization options at this historic cemetery, which has the largest collection of private (family) mausoleums and sarcophagi in the State of Missouri, in a wide array of architecturally-acclaimed historical styles. Space for traditional casketed/vaulted ground burial exists within Bellefontaine's dedicated grounds for the next 200 years at present rates of usage. As of 2012 over 87,000 people have been buried at Bellefontaine Cemetery, and approximately 100 new burials take place each year. Bellefontaine remains a non-profit, non-denominational cemetery, and still holds over 100 acres of open, unused land. Some of this extra land has recently been converted into prairie and woodland. Bellefontaine contains over 14 miles of paved roads and, as an accredited arboretum, is home to over 180 species of trees and shrubs. A new lakeside garden and columbarium were completed in 2010, and other major landscaping projects are planned or in progress. The cemetery contains the graves of many prominent pioneers to the West, as well as businessmen, politicians, and generals who remain significant figures in the history of St. Louis and the United States. The oldest graves in the cemetery are located on pioneer Edward Hempstead’s family lot and date as far back as 1816. 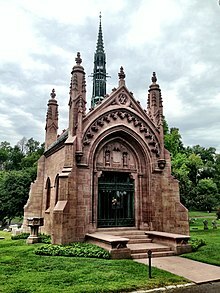 Many of the wealthiest families at Bellefontaine are interred in ornate mausoleums which overlook the Mississippi River and draw from Classical, Romanesque, Gothic, and Egyptian architectural styles. 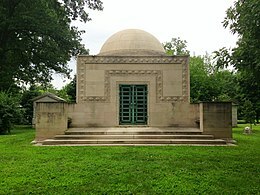 Among the most notable mausoleums in the cemetery are: the Wainwright Tomb, designed for Charlotte Dickson Wainwright by the famed Chicago school architect Louis Sullivan in 1892; the Busch Mausoleum, designed for Adolphus Busch and Lilly Anheuser by Barnett, Haynes & Barnett in 1915; and the Brown Brothers Mausoleums, designed in 1910 by Isaac Taylor and in 1928 by Mauran, Russell and Crowell. There are also a number of large family plots in the cemetery, many of which are marked by tall obelisk monuments with elaborate bases. Guided tours of the cemetery’s main historical and architectural highlights are available and are open to the public. Alternatively, visitors can obtain self-guided tour brochures at the cemetery office. The cemetery was listed on the National Register of Historic Places in 2014. The main page for this category is Category:Burials at Bellefontaine Cemetery. Thekla M. Bernays (1856–1931), Women's suffrage's activist, author and lecturer. Susan Blow (1843–1916), educator, known as the "Mother of Kindergarten"
James Eads How (1874–1930), son of wealthy St. Louis family, known as the "Millionaire Hobo"
William Massie (1829–1910), riverboat captain famous for living with the bullet that killed Wild Bill Hickock lodged in his wrist. James F. Merton (1845–1900), Medal of Honor recipient for actions during the 1871 United States expedition to Korea. Hannah D. Pittman (1840–1919), author of the first American comic opera. ^ "Weekly List of Actions, 8/11/14 through 8/15/14". National Park Service. Retrieved 2014-08-31. ^ "DONNELL, Forrest C. - Biographical Information". bioguide.congress.gov. ^ "Captain William Massie". 28 March 2010. ^ Eriksmoen, Curt (September 2, 2012). "Riverboat captain 'carried' bullet that killed Hickok". The Bismarck Tribune. Retrieved 18 August 2016. ^ "National Park Service" (PDF). Wikimedia Commons has media related to Bellefontaine Cemetery (St. Louis, Missouri).